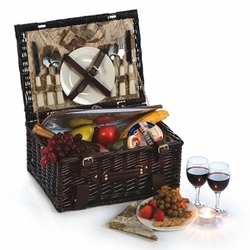 Elegance, best describes the European inspired Picnic Plus Wynberrie 4 Person Picnic Basket. 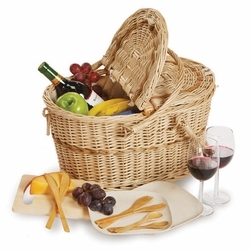 Designed in the USA with traditional European features and a classic design, the Wynberrie basket features a honey stained hand woven willow exterior and striking Navy pinstripe lining. 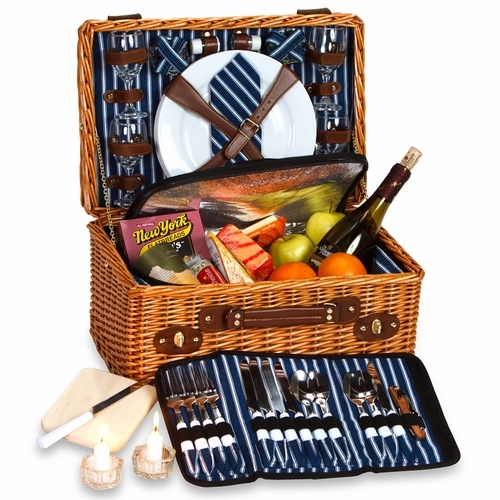 The Wynberrie picnic basket includes a complete setting for 4 persons; glass drink ware, large dinner size ceramic plates, stainless steel flatware, cotton napkins, wooden handle multi purpose waiter's tool, votive candles, salt/pepper shakers, wooden cutting board, cheese knife and bottle stopper. 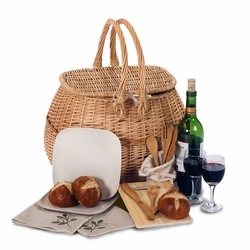 The large thermal foil lined insulated cooler section holds cheeses, sandwiches, snacks, wine bottle, fruit and beverages for a memorable day outing. 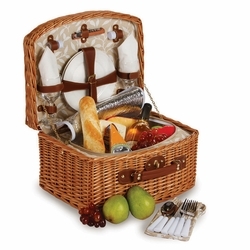 Handsome leatherette buckles and portable component carrier.